An organization which has long been connected with Ka ‘Imi is the Friendship Force of Kaua’i. One branch of the global peace initiative called Friendship Force International, this group shares the ideal which we express in the phrase “lulu ka maile”, scatter the seeds of love far and wide. Dedicated to establishing peace by building friendships between people of different nations and cultures, Friendship Force’s slogan is “a world of friends is a world of peace.” To establish these friendships, the organization’s headquarters in Atlanta, Georgia, USA arranges home stay visits among its many clubs around the planet. Usually the visitors, or ambassadors in Friendship Force lingo, spend a week with a host club. Sharing their hosts’ daily lives, they see their nation and culture from the inside, not through tourist promotions or media presentations. This personal contact should make them less prone to stereotype or demonize a country and its people. Friends may disagree while still remaining friends; they are less likely to resort to violence as a means of settling disagreements. By providing the seeds of love an opportunity to grow, Friendship Force hopes to make the world a garden of peace. Does it sound too good to be true? Ask any of the Kaua’i group’s long-time members, and you will hear about friendships that have far outlasted the week’s visit. In the 19 years since the local club’s establishment, members have hosted people from Brazil, Taiwan, England, New Zealand, Germany, Korea etc. Long after the official exchange has ended, people continue to correspond, send gifts, and visit one another. The network spreads even wider. For example, when Roselle and Jim Bailey, who were members of the Kaua’i group while they lived in Kaumakani, were in Berlin in October of 2001, one of those who attended the halau performance at the Dahlem museum was a member of the Friendship Force club of Berlin. Two weeks before, he had hosted two ambassadors from Kaua’i. They had told him about the event. As a result of their connections with Friendship Force, members of Ka ‘Imi have frequently performed for the Kaua’i club’s functions. The most recent of these performances took place on 31 March at Po’ipu. It did not start very auspiciously! Dancers arrived in full regalia at the appointed site, expecting to meet and eat with a jolly group of ambassadors and hosts. Yet no group was to be found! The pavilion which was to have been the party site was deserted. Some frantic calls, made possible by one well-prepared ‘olapa who carried her cell phone, set things to rights. Because of blustery weather, the party had moved to a nearby home. All was soon well. For many of the ambassadors, who came from various parts of South Australia, the halau’s performance was their first serious look at Hawaiian culture. To those whose idea of hula was the tourist image of coconut shell bras and raffia skirts, it was eye-opening. Several of the guests made a point of saying they considered the evening one of the high points of their visit to Kaua’i. Anyone who would like to find out more about the Friendship Force is welcome to visit the organization’s website at: www.friendshipforce.org. 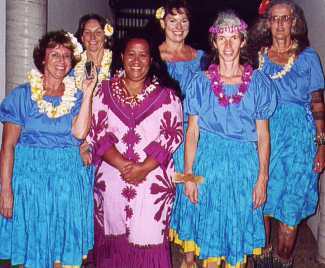 HALAU MEMBERS WHO PERFORMED for the Friendship Force of Kaua’i on 31 March, 2003.